Tales Of A Nomad: Backwaters of Kerala...!! It is not without a reason that Kerala is known as God's Own Country. The landscape is bewitchingly beautiful and encapsulating, leaving the travellers and tourists mesmerized. It is not often that hills, beaches,lakes and forests appear geographically so close to each other. But, in Kerala the distances of these landscapes are on the shorter side giving its visitors a plethora of options to explore within their limited travel time. 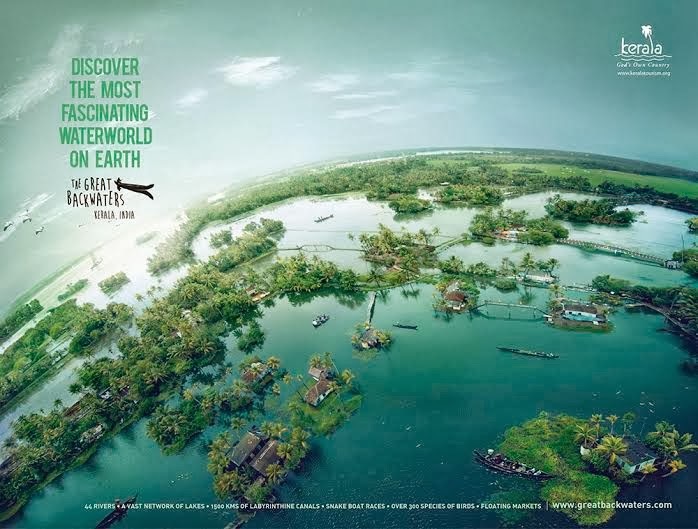 Of these many landscapes, it is the backwaters that stands out astonishingly with its huge network. With 44 rivers, numerous lakes, more than 1500Kms of water canals, snake boat races, over 300 species of birds and floating markets, what more can you ask for? 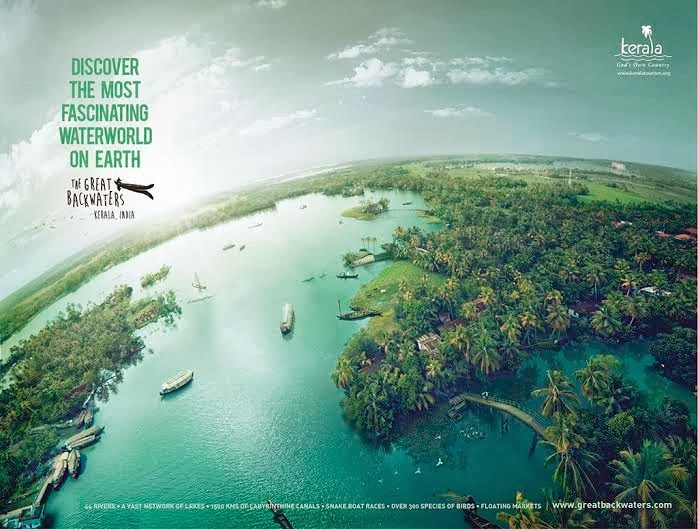 It is absolutely a water world out there, showcasing the magnificence of Kerala backwaters. Floating away on one of the kettuvelloms (house boats), enjoying the swaying palms, the lovely vistas, the cool breeze and the delicious local food is the best way to explore the backwaters. Get on to one of the small boats and row away through the small canals to some secluded corner enjoying the villages and greenery. Numerous species of birds are seen either perched on branches or gliding over the water bodies. Isn't it exciting to watch the birds flying as you keep floating? The boat races held during the months of July to September are fun and frolic. See the nail biting finishes and hear the ardent fans roar as they cheer their respective teams. The backwaters of Kerala is definitely a must explore. So what you waiting for? Go ahead and float away on those lovely waterscapes. 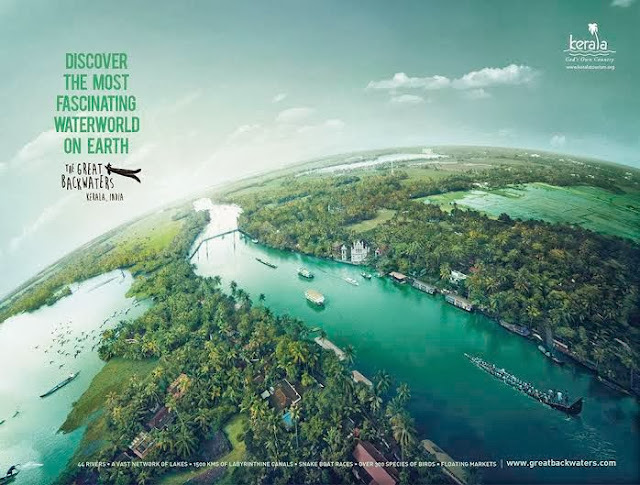 Visit http://greatbackwaters.com for more details. It is an interactive website, I did try it out. Stunning panoramic views of Kerala backwaters. Indeed it is God's Own Country. Let me wish you a Merry Christmas and Very Happy & Prosperous New Year. Kerala God own Country, Nice. Images of Kerala that I have seen from plane are very nice. Have to explore the backwaters someday! The top views are spectacular! Incredible post and excellently written post..
New campaign for backwaters, eh? Those pics are superb, right? Thank you for sharing these; hadn't heard of this one yet.